Dogbreath 19 Preview: Shadow of the mutant. 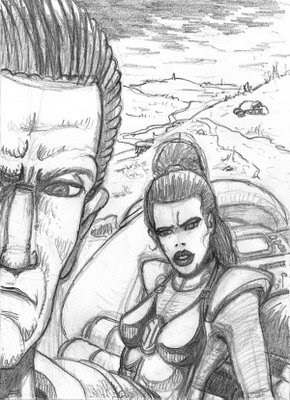 Dogbreath 19 is going to feature the concluding chapters of Shadow of the Mutant by Alec Robertson and Bruce McLaren. Bruce has even agree to paint a cover for the issue. He’s very kindly sent through these images that may well appear at some point in the issue. These are the top five entries in MCN’s Yamaha Livery Design competition, handpicked from hundreds by our judging panel which included Troy Corser and Noriyuki Haga. Now it is down to you to choose the overall winner of the competition. The winner will have their design painted on both Corser’s and Haga’s Yamaha R1 race bikes for the Donington Park WSB round on September 5-9. 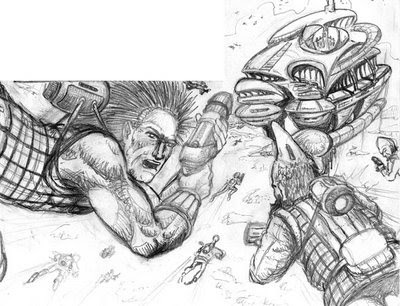 One of these five finalists is Jim Grey, a Zarjaz contributor! Good luck James!